PRSA defines Public Relations as, “A strategic communication process that builds mutually beneficial relationships between organizations and their publics.” With respect to its author, this textbook definition doesn’t exactly unveil the day-to-day happenings of a PR firm. True – there are important keywords, but unless you’ve visited an agency it’s difficult to understand. Luckily, I’ve had the opportunity as a PR intern to learn how publicists “strategically” communicate. So to clear up any confusion, here is what PR really means. These two tasks are my favorites and lucky for me they’re the responsibility of us interns, yay! Checking samples in and out of the showroom (aka sample trafficking) teaches the importance of organization and attention to detail – plus it allows you to become an expert on the clients collections. The better you know the client = the better work you’ll do for the client. While pulls and returns are taken care of by interns, pitches and releases are important duties completed by Account Executives. What I love about Post+Beam is how interns also share this responsibility and are given the opportunity to learn the PR style of writing. I have yet to write a pitch or release myself, but I look most forward to learning how this summer! I may be the newest addition to Post+Beam, but it hasn’t taken me long to pick up on the importance of puppies and refreshments in the office. We have the Almighty Keurig and Espresso machine at our disposal; not to mention Starbucks coffee is easily the best way to perk up a Monday morning. As for puppies, our Director Kelly has a little bed and dishes for her dog Bella to pay everyone a visit. 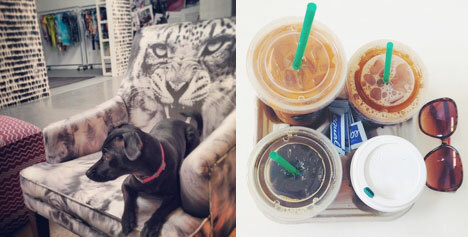 Cute doggies and refreshing drinks just make everyone happy and productive – What’s not to love!